Manage your bookkeeping needs easily with no need for training. Simple step-by-step instructions and examples make it easier than ever. Record all money in and out, track and manage receipts, payments, cashflow, budget plus reconcile your bank and report your VAT. Keep your records safely for as long as you need, with strong, sturdy binding and high quality paper inside. 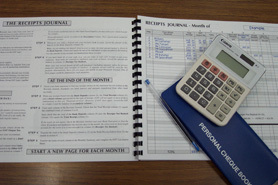 Keep excellent hard-copy records of your small business accounts with the original ‘Accounts Manager’ manual bookkeeping system.